My mother-in-law's friend gave her a bag of home grown Kumquats. These Kumquats are beautiful as they are grown as ornamental plants. The kumquat fruit is orange and has a glistening rind; the shape can be round or oval and unlike the orange, the sweetest part is the rind. The inside is quite acidic and sour. Since Tết (the Vietnamese Lunar New Year) is fast approaching in a couple weeks, I planned to make a few traditional dishes to celeberate Tết, the first being Mứt. Hence the arrival of these Kumquats was impeccable. Mứt is one of those dishes that can't be missed at Tết, so I decided to turn these beautiful but sour kumquats into Mứt Tắc (Candied Kumquats). Just like candied orange and grapefruit peel, Candied Kumquats are also easy to make. They pair well with hot green or black tea as I learned from my husband, but watch out, you will be addicted to these. The jar I just made is already gone. I guarantee you won't just try one! In a bowl, mix 6 cups of water with lime stone paste. Let it settle for a while until the water becomes clear. Transfer the clear water to another bowl. Discard the lime stone paste sediments. In another bowl, mix 6 cups of water with salt, set it aside. With a pairing knife, make a few eyelet cuts into the rind of the Kumquat. Discard any seeds by squeezing it. Keep the juice for the simmering process later. Soak Kumquats in salt mixture. Most of the recipes recommends peeling a thin layer of the Kumquat rind but this process is so time consuming, so I will leave this up to you to decide. Transfer the Kumquats to lime stone paste mixture and soak it for about an hour. The benefit of lime stone paste is to make the Kumquats shiny and translucent . Rinse with cold water. Gently squeeze the water from each kumquat. In a pot, mix sugar, Kumquats juice and Kumquats then heat over high heat until it comes to a boil. Reduce heat to low and simmer for about half an hour or until the kumquats become more translucent. During the simmering process, use a spoon to splash the syrup from the pot onto the Kumquats. Use slotted spoon to remove the Kumquats. To create flower shapes, press a Kumquat down with your thumb and index finger. Allow it air dry on a baking rack or arrange it on a baking pan and dry it in an oven, 2nd lowest rack at 200 degree for about an hour. If you have parchment paper, line a baking pan with it to prevent the syrup sticks on the baking pan. Thank you so much for the post on "mut". With Vietnamese Tet coming up, I wanted to make mut at home since I've heard horror stories about what go into making "mut" at the markets. Could you tell me how long we need to soak the kumquats in the salt solution? Thank you. As for soaking process, soak the kumquats in the salt solution for about half an hour. Have fun making it and Chúc mừng năm mới! Nhìn rất bắt mắt và hấp dẫn lắm lắm!!! You cannot imagine what I went through to get the kumquats for this recipe! Most fruit vendors or supermarket people promised me kumquats in April! Even my friends' families. I need the kumquats now for Tet. Sooo, I sweet talked a fruit vendor at the Farmer market to look into it for me and lo and behold, I got my kumquats. The recipe turned out simply perfect! Thank you for sharing the recipe with us. Chuc mung nam moi to you and your family. Loan ơi, mình làm mứt tắc hôm nay. Kết qủa mỹ mãn lắm. Vào đây để cám ơn Loan đã chỉ rất chi tiết nên dễ làm. Có điều mình làm 4 lbs nên ngồi rạch khía xung quanh tắc rồi lấy hạt .... chời ơi, phê luôn. Làm cả buổi mới xong và giờ mới sên xong nè. Làm cực nhưng công nhận thành phẩm ra ham lắm, nhìn mấy trái tắc bóng bóng, trong veo, màu nâu đỏ đẹp tự nhiên, thích ơi là thích. Chắc chắn năm tới mình sẽ làm mứt này vào dịp Tết. Yes, cutting the kumquats does take a long time. Em lam khoang two pounds but it took me so long, especially I had to cut each of the kumquats and taking pictures at the same time. Con phan white lime paste thi luc em lam em khong co measure. Nen khi write up the recipe, I just guessed it :-> De em edit lai recipe. I made it again later without white lime paste since i ran out of it and the kumquats weren't clear though it still tasted very good. Thanks for the comment chi. There are 2 soaks. First, after cutting the fruit and removed the seeds, soak fruit in salt water. Once all the fruit are already in salt water, remove the fruit and soak them in the clear lime water. I didn't soak them before I cut. But cutting the fruit and removing the seeds take a long time. I just got a gift of kumquats and did not want to make marmalade--then I found your 'mut' and am going to make the...however where would I get the white limestone paste??? 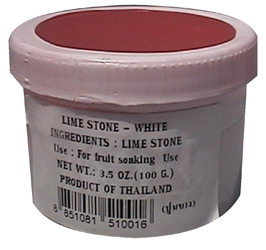 White limestone paste available at most of the Asian Supermarkets. There are two types: white and pink . Get the white limestone. Hi, could you please tell me how long these keep & how to store? Could I ship them (2-3 days)? You can keep it at room temperature for a few weeks. There won't be a problem to ship it out. My husband and I have two lovely daughters. I'm incredibly fortunate to be able to stay at home to raise my daughters and experiment with food. I was probably in love with food from my mother’s womb, but didn’t realize it until I found myself spending every cent of my allowance on snacks and frequently begging my maid to let me help out in the kitchen. The desire to cook was intense. I snuck into the kitchen when my maid was asleep and stole rice and matchsticks so my friend and I could cook it in our toy clay pot. I even bought ingredients from the market to make frozen banana dessert topped with shredded coconut and roasted peanuts and sold them to the neighborhood kids. These fond memories eventually led to my Vietspices blog - born in October 2010- with the purpose of making memories with my girls and sharing our recipes, but ultimately creating a foundation for charity. I envision something that wound extend beyond my daily bread to encompass the basics of daily living – food, clothing, shelter - for those less fortunate. And this gave birth to The Spices of Life (Hương Vị Cuộc Sống) Foundation. It is under construction as I work out the logistics. Please stay tuned!